Securing a pivotal role in a film that’s is destined to get the Hollywood community buzzing and garner strong audience attention is one of the moments—for a young African-American actress—that will always have a very special marker. For an ingénue, Rayven Ferrell who plays Sekyiwa Shakur, the baby sister of rap icon Tupac Shakur, in “All Eyez On Me,” landing this dream job was like placing a proverbial cherry on the proverbial cupcake. Directed by Benny Boom and starring new comer Demetrius Shipp Jr., as Shakur, the film—which opens nation wide on June 16, the late rapper’s 46th birthday—is already no stranger to controversy with lengthy legal battles on “who and who does not” have the right to tell the slain rapper/actor/activist story. L.A. Watts Times (LAWT): How did you get the part? 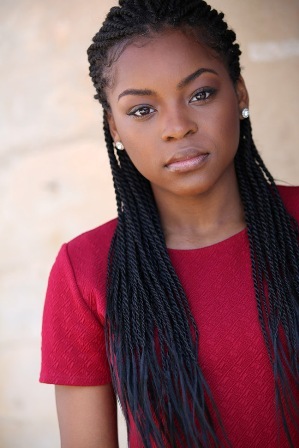 Rayven Ferrell (RF): I was casted for the role of Sekiywa Shakur just as I was for any other project. I remember when I auditioned for the role and originally, and feeling weird because I didn't get taped. In my mind, I'm just like "how are they going to remember me?" ...so that alone kind of threw me off from thinking that I would get the role. Fast forward a month later, I had a dream that I actually booked it. Once I woke up, I texted my agent asking if the role had already been cast yet and he said no. A few weeks later, I got called back and by that time I already felt that I had it. So much that once I got in the room the execs were laughing just because I was smiling so hard because I was so happy to feel like that it was mine already. LAWT: What was it like working with Benny Boom? RF: Working with Benny Boom was a huge blessing. He had a very clear vision and it showed. He directed us so well that the scenes that we shot moved super swiftly and in a timely manner because he knew what he wanted. Not only that, I was a huge fan of Benny Boom before this film so I was excited from the start. LAWT: Tell me about your character? RF: Sekiywa Shakur is Tupac's baby sister. To the average person and outside world she was very much to herself. She wasn't the type to be in the mix of groups because of her own way of thinking. But to her family she was very outspoken and actually funny. Her and Tupac had a very close knit relationship because through a lot of times in their early lives, they were all they had. She was super dependent on Pac and I think she is one of the people who [pulled] … out that leadership in Pac at a very early age. He was forced to take care of her and provide for her so it caused him to grow up quickly. In the end, I do believe that they taught each other a lot. LAWT: What’s the most surprising thing about working on the film? RF: The most surprising thing for me about this film is how much I learned about Tupac as a person. I got to realize why he did so many things and make so many certain decisions. Before this film, I was a fan of Tupac because of his art ... his music, his acting career, and his poetry. After shooting this film, I became a fan of Tupac because of who he was as a person. The way he moved, and his thought process was not average. He knew of his purpose, and he wasn’t going to let anything prevent him from fulfilling that purpose. He was willing to be viewed negatively, judged, and even willing to die for it. That in itself is truly inspiring. RF: Right now I am continuing to prepare myself for whatever opportunities God brings my way. My goal as an actress is to get as diverse with my craft as possible as well as to get into television more ... so that’s what I’m working on right now.